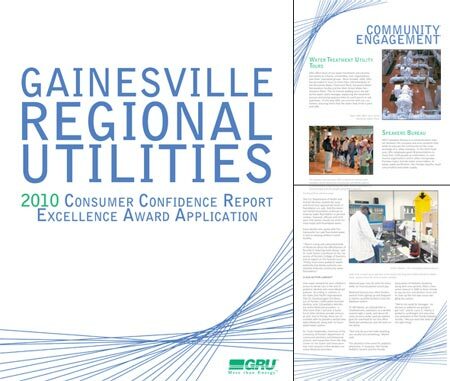 Gainesville Regional Utilities submitted its annual water quality report to the Florida Department of Environmental Protection’s 2010 Consumer Confidence Report Excellence Award competition and included an original informational brochure about the GRU water/wastewater division’s projects and outreach activities. I researched, wrote, designed and produced this 19-page publication from start to finish as a companion to the awards application. With the help of my publication, GRU’s water quality report won the state award from the FDEP and progressed to the regional competition. 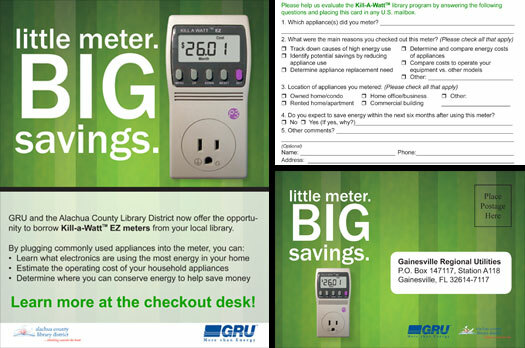 Gainesville Regional Utilities teamed up with the Alachua County Library District beginning in June 2011 to offer library users the opportunity to borrow Kill-A-Watt EZ meters from local library branches, which calculate the amount of electricity used by individual home appliances and equipment. I worked on the publicity campaign for this program by creating posters for display in the library branches, postcards with surveys for patrons to return after using the meters, a news release from GRU and a story for the library district’s quarterly newsletter. 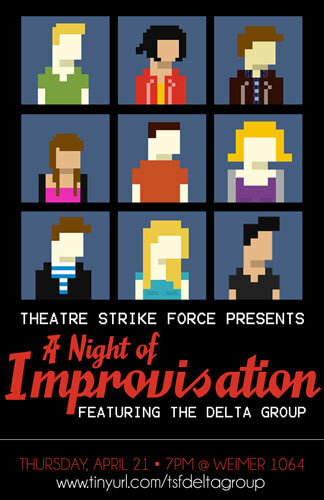 Theatre Strike Force at the University of Florida has several long-form improv performance teams. The group I was cast onto for Spring 2011, the Delta Group, held their last show of the semester in April 2011. I created an 11×17 and a 4.25×5.5 version of this poster for distribution around campus. The images are caricatures of the Delta Group cast members created with 8bit.me. Theatre Strike Force at the University of Florida brought famed improvisational comedy troupe the Reckoning down from Chicago to perform for and share insight with the UF student body. This image was used to promote the show on Facebook. The 100+ seat venue was filled past capacity on the night of the show, and the Reckoning’s performance got rave reactions from the audience. 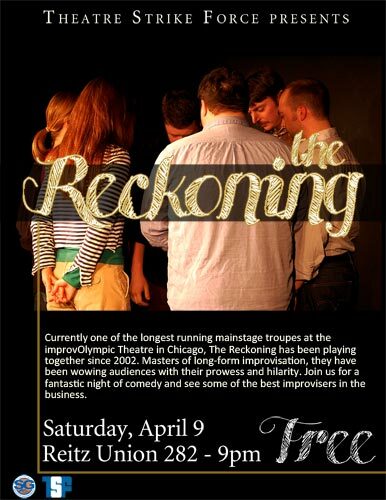 For the 2011 spring semester at UF, I was cast into the improv troupe The Delta Group, and we were very fortunate to open for the Reckoning, which was a thrilling experience and a really fun night. Theatre Strike Force’s primary philanthropic endeavor each academic year is Relay for Life, a fundraiser for the American Cancer Society. 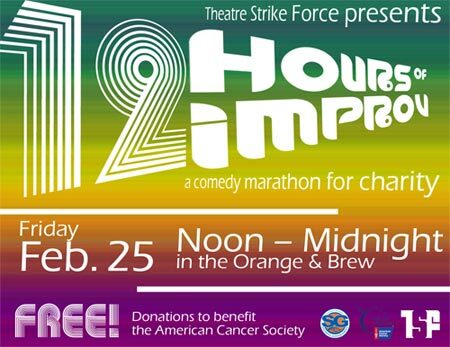 One of the groups fundraising events is the 12 Hours of Improv comedy marathon, where players perform shows in 15 to 60 minute sets from noon to midnight. 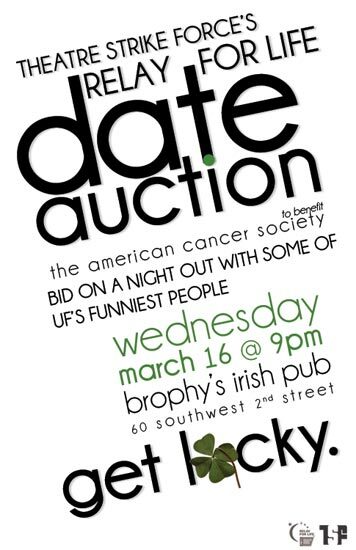 In 2011, the group raised nearly $700 in audience donations from the show. This flier was created in three sizes: quarter-page-sized handbills, 11×8.5 fliers and 17×11 posters. This flier was used primarily for web, with distribution on Facebook. Gainesville Regional Utilities participates in the annual Spring Garden Festival at Kanapaha Botanical Gardens, one of the largest botanical gardens in Florida. 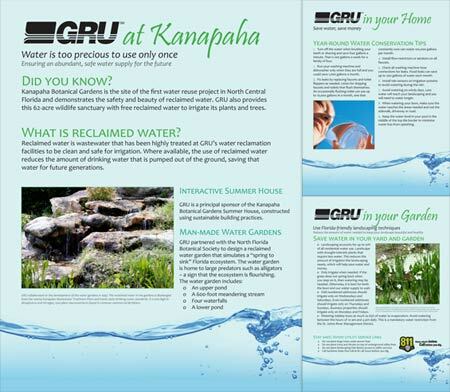 Because GRU provides reclaimed water irrigation at the site and is one of the principal sponsors of the park’s Summer House, we take the opportunity each year to promote water and energy efficiency to visitors at the festival. I designed three coordinating informational display boards for GRU’s booth. These posters were reproduced in high resolution on foam core at 18×24 inches.